The five Tony award winner ‘Warhorse’ opened last week at SegerstromCenter for the arts in Costa Mesa California. Segestrom Hall shined its maximum capacity with almost 3,000 souls that through two hours and a half, enjoyed the ups and downs of this complex story situated in England during WWI. Albert, sixteen, gets a foal thanks to his father Albert and his gambling. 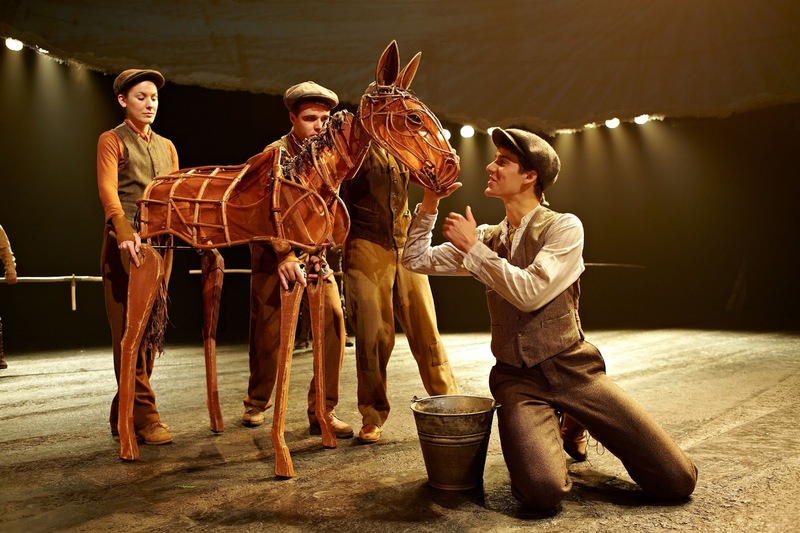 ‘Joey’ the foal comes alive onstage; it is a puppet made out of mostly cane, soaked, bent and stained. Three puppeteers bring it to life: one for the head, one for the torso and one for the tail while making breathing, neighing and puffing sounds… Simply fascinating. ‘Joey’ has a light cinnamon color. 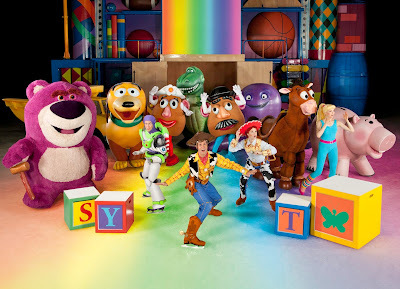 The puppeteers wear overalls and boots of the same color; even though they are seen all the time onstage, the handling is so fine, so delicate, they camouflage with the puppet. Albert tries to befriend Joey but the foal is somewhat unsociable at first. Slowly it starts trusting Albert and allows him to teach it different tricks. Months pass and Joey is now a strong, young horse. Another great deed in the production where a transition between the foal and the horse occurs. A 120 pound Joey bursts out onstage handled by three other puppeteers that are connected to the aluminum spine lined with leather so the horse can be ridden. 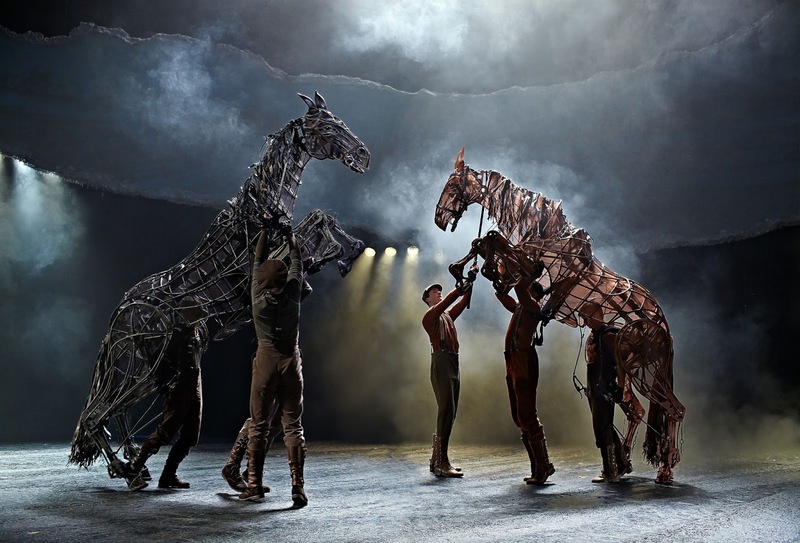 Warhorse is based on the beloved novel of Michael Morpurgo and adapted by Nick Stafford. A breathtaking production that captivates and moves the audience as the story unfolds. The puppetry is handled with great ability and professionalism. Giving this musical its great essence and meaning. Warhorse will be playing until February 3rd at Segerstrom Hall. Tuesday thru Friday: 7:30pm/ Saturday 2:00pm and 7:30pm/Sunday 1:00pm and 6:30pm. · Active duty military personnel with current ID can purchase specially priced $20 tickets at the center box office: (714) 556-2787. · Rush tickets may also be available, call the box office on the performance day to find out. · There is an interactive exhibit of puppetry and WWI memorabilia at the theatres second floor.